You really can’t get more local than your own driveway. 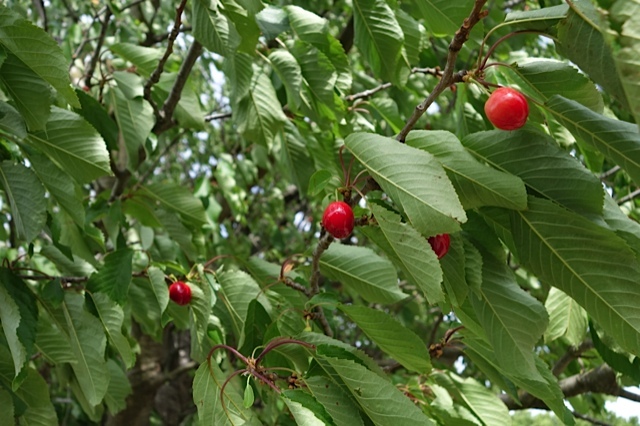 The cherry tree is the size of a small house and heavily laden but we hadn’t noticed the fruit was almost ready until the truck delivering the new fridge took out a branch and knocked a couple of hundred to the ground. What a day! 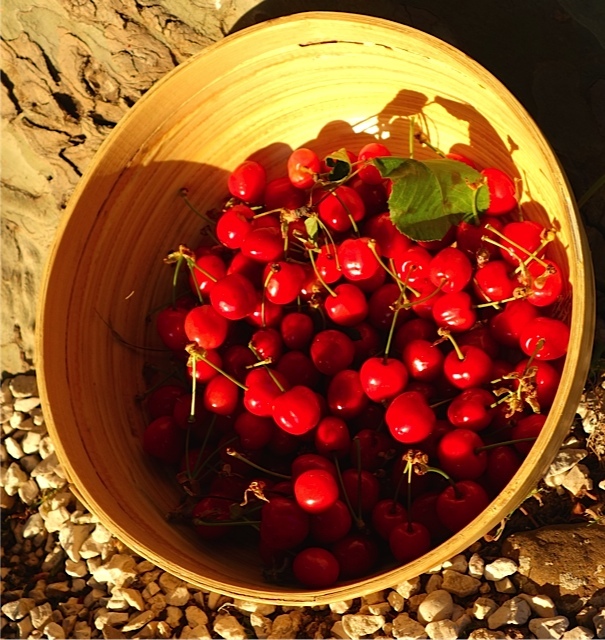 A cherry harvest and a new fridge (there simply wasn’t enough room in the tiny temporary one for both rosé and food for the children. Sacrifices had to be made). 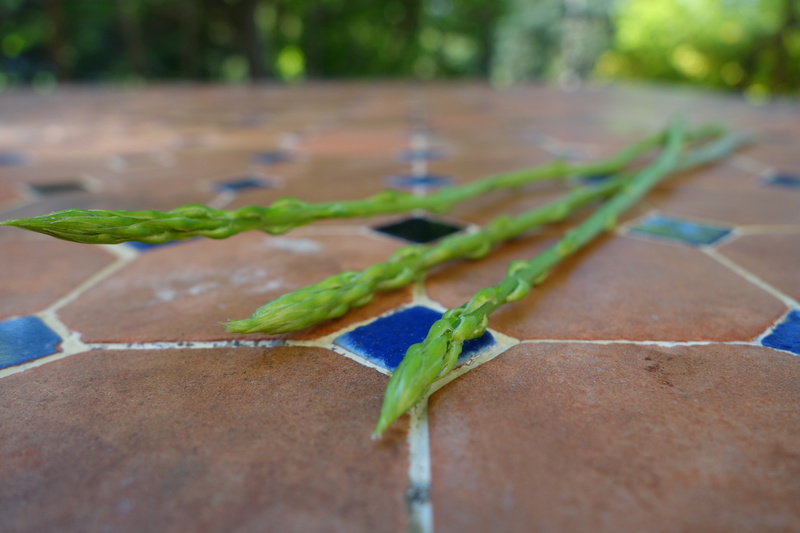 Then there’s the wild asparagus – hunted and eaten one precious sprig at a time by Medium. Mme E showed him how to recognise the plant that marks its hiding places so he tiptoes barefoot around the thistles and deep into hedges to find the treasure. Medium ignores the easy pickings in the remains of the asparagus crop next door. The farmer, Monsieur L, is far too kind a man to steal from – although if I was inclined to steal from him, I’d pinch his dog – that dusty, lean, red border collie far too happy in its existance to pay us any attention at all. She wouldn’t stay long. Dozens of nut trees are livening up – which makes me wonder if Red and Brown, our resident squirrels, are not alone, but simply the extroverts in a more reserved family of hundreds. 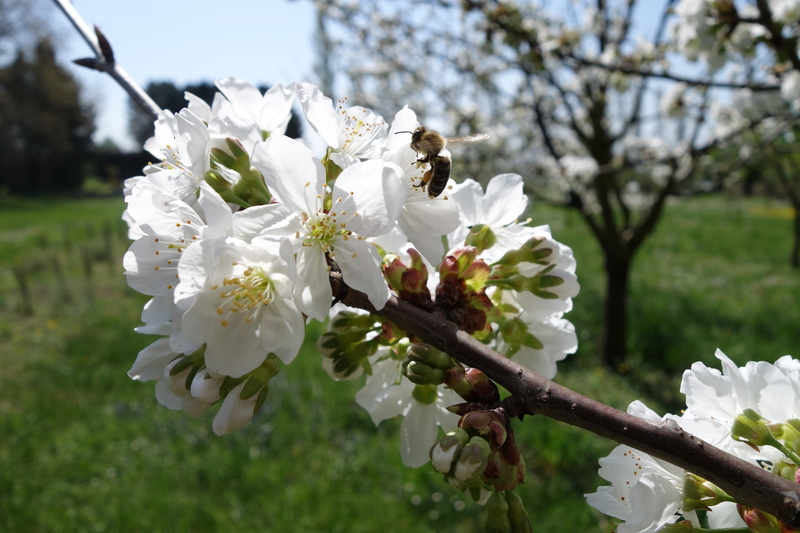 In the orchard there are apricots and plums, peaches and nectarines, grapefruit, orange and cherries galore. 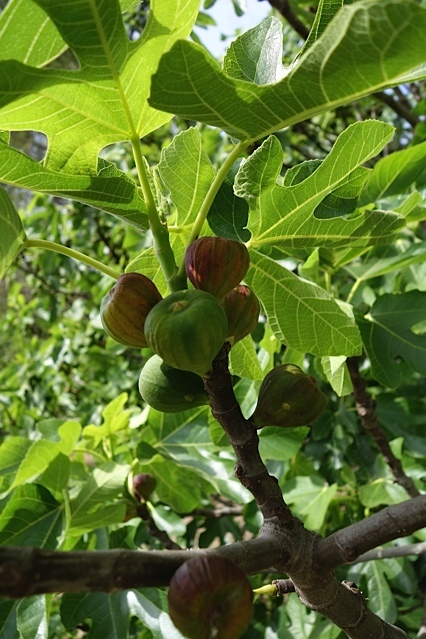 The fig tree is laden and I had been expecting a decent scrap over those between us and the birds, bats and squirrels however I learned this week that there is some sort of fertilisation problem that is beyond the limits of my French gardening vocabulary. Needless to say, the figs are “mal”. Speaking of animals there’s something else living here too – mysterious crottes in unexpected places like an upstairs outdoor window ledge: too big for a dog, too large for a squirrel, and an eerie, perfectly-formed “O” call late at night…could this be what the fox says? 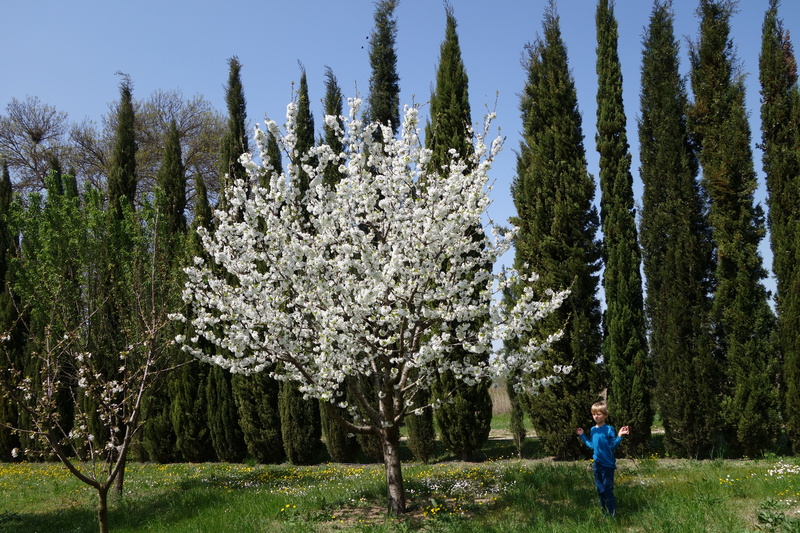 The handful of olive trees scattered around is hardly a plantation but we are hoping to have a little harvest day and take our sack of olives to the local moulin for cold-pressing. That’s what the locals do. The minimum amount is 5kg. I am sure we can manage that and Small, Medium and Large are equally enthusiastic about our very own brew of olive oil. That’s because the olive oil is so good here that we’ve all got a bit weird about it – sloshing it onto our bread, frowning across the table at each other and making very un-French “mmm-mmmm-mmmmm” eating noises. Still, let’s see how long the enthusiasm lasts on harvest day when it’s 30 degrees, the sun is blazing and the arms start getting heavy. Sabbatical Man is taking inspiration from his environment and plotting his vegetable plot – with the encouragement of Monsieur Y, the jardinier who used a little digger to liven up the soil of the neglected veggie patch. Yes, it was that hard. Sabbatical man has bought a spade to add to the axe and some other enormous wood-splitting device he bought at the supermarket. I am not sure whose suitcase these things are going to fit into on the way home. Also, alarmingly, tonight he started talking about chickens. I foresee issues. The construction of a chicken coop for starters. That would require more tools. Compared to our rich volcanic soils at home, the earth here looks cruel, but all around us we see healthy crops: durum wheat, asparagus, leeks and carrots – often with thousands of poppies sprouting in between. One crop is harvested and within the week something else planted. Indeed, Monsieur Y’s main task seems to be taming rather than than nannying the garden. Down the road and across the bridge a man in a shed sells fruit and vegetables and gives away punnets of raspberries if he’s in the mood. “C’est tout bio! Il faut y aller,” Monsieur Y told us. “It’s all organic. You have to go there.” Then he told us how many insecticides are sprayed on many common fruits and vegetables in Europe. I hope that he didn’t really say a number starting with 40 but I fear I understood correctly. Yes, it is most definitely better. The fresh produce looks divine. Hope there will still be fruit and nuts when we come. Sabbatical man great to hear you are developing garden skills. Middle good luck with your asparagus hunting. Magpies have had a good go at the cherries – need to pick frequently or we miss out! You will love it! But we are thinking of getting some nets because the magpies are beating us to the cherries! A red border collie, how lovely – you must bring one home – sans dust. Am loving your writing and living vicariously it. Ça me rend heureuse chaque temps que je le vois! Meilleur vœux de Nouvelle-Zélande, j’attends avec impatience ton prochain poste! Merci beaucoup Emma. Tu es trop gentille! C’était genial de recevoir ton message! L’Alliance Française me manque – en particulier les conversations des pandas. J’adore le video – qu’est que c’est un loutre?? Je dois le chercher en ligne! Trop mignon. Merci encore pour le feedback généreux. Il y a beaucoup de bonnes choses ici et je suis vraiment heureuse que j’ai dépenser tout le temps et l’argent en les cours….ca fait une difference ginormous!! Keep it up!